These pans are hanging up in our kitchen and they just look fabulous. Using them is a dream. Consistent heat, responsive to changes and easy to clean once the meal has been prepared. They are and will be a treasured possession for a lifetime. Many thanks to Falk Culinair for producing such an excellent product. 719 customers found this review helpful. Did you? Yes, I did! 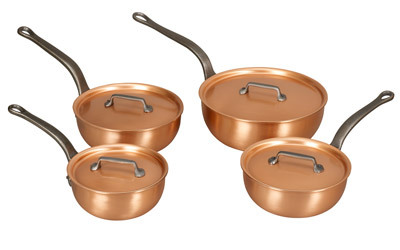 Very happy with my copper cookware purchase as well as the fine service received from the folk at Falk. The staff were really helpful and my pans arrived the next day all very well packaged. The build quality of these is superb. They are very solid and look fantastic in our kitchen. So good I have just bought a rack to display them instead of hiding them away in a cupboard. They are easy to clean as well. The range of sizes in the set is perfect for any cooking task. 742 customers found this review helpful. Did you? Yes, I did!